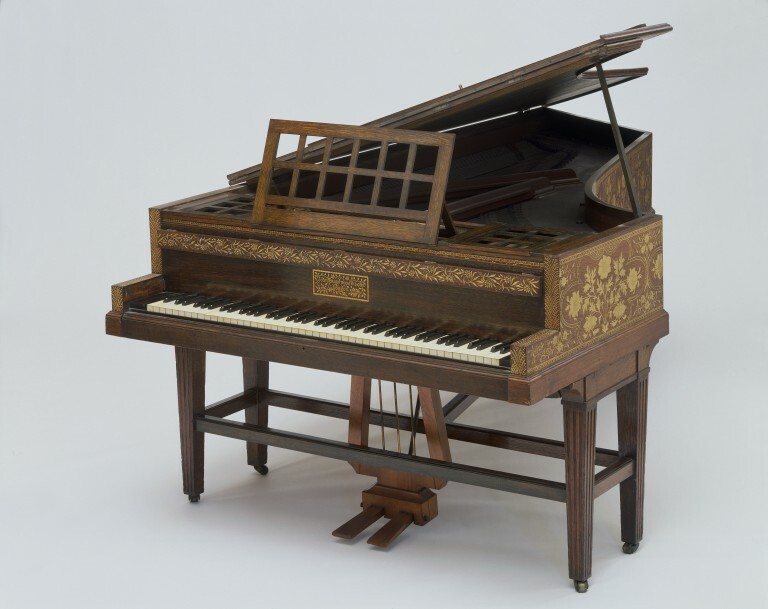 This piano was built in 1883 by John Broadwood & Sons for A.C. Ionides, a friend and client of William Morris, Sir Edward Burne-Jones and other Pre-Raphaelite artists. Kate Faulkner, who designed wallpaper for Morris & Co., decorated this instrument with gold and silver gesso to sketches made by Burne-Jones, so that it would match the interiors of Ionides' London house at 1 Holland Park. This piano was exhibited at the first Arts & Crafts Exhibition in 1888. The keyboard compass is 85 notes, AAA-a4. The instrument is straight strung with individual hitchpin loops on an iron frame composed of separate elements bolted together. The stringing comprises eight overspun unichord courses , three overspun bichord courses, six overspun trichord courses, and 68 simple trichord courses. The instrument has an English check action with underdampers to b2. The dampers are strongly graduated in size from bass to treble. The two wooden pedals operate the una chorda (left) and sustaining (right) devices. The oak case was originally stained green (now faded) and is decorated with birds, fruits and flowers executed in relief in silvered and gilt gesso. This grand piano was commissioned from Morris & Co by A.A. Ionides for the second drawing room of his house in Holland Park, London. The design of the case is probably due to the influence of Edward Burne-Jones and his earlier designs for the Orpheus piano, made by the firm of John Broadwood, which originally belonged to Frances Graham, Lady Horner. Burne-Jones was interested in modifications to the shape and size of grand pianos and revived features taken from eighteenth-century harpsichords, including a trestle stand with six legs, a rectangular cover for the keyboard, and a sharp angle at the narrow end of the top. All these features were incorporated into the Ionides piano which was manufactured by Broadwoods. The gesso decoration was designed and executed by Kate Faulkner who was encouraged to persist in such delicate work by Philip Webb. The grand piano was given to the Museum by Mrs. A.C. Ionides, a daughter-in-law of A.A. Ionides. Burne-Jones based the design on the case and stand of a harpsichord. His piano formed part of the lavish refurbishment of 1 Holland Park, commissioned by Alexander Ionides, brother of A. C. Ionides. The house was decorated by Morris & Co., the firm established by William Morris, and became a showpiece of advanced artistic taste. Attribution note: Although Broadwood pianos were produced on a large scale, the decoration by Kate Faulkner to Burne Jones's sketches for A.C. Ionides makes it unique.